Jennifer Lawrencehas once again volunteered as tribute. 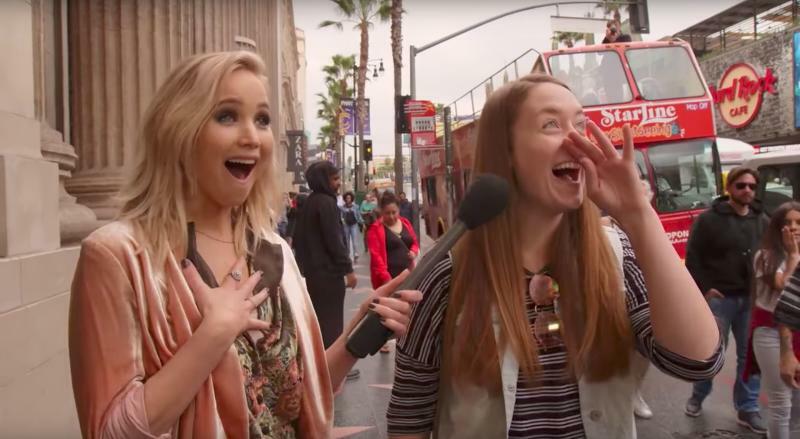 While guest-hosting “Jimmy Kimmel Live!” on Thursday, the actress signed up to hit the streets and ask people to name five movies she’s been in. Though it wasn’t a life-or-death battle like “The Hunger Games,” there were equally devastating results. “You ask me about Aniston, I can tell you,” one woman said. The segment is fun and ridiculous, similar to the rest of theactress’ “Kimmel” episode. But there are some lessons to be learned. For pedestrians, the “Hunger Games” movies could knock out four of the five right off the bat. For Lawrence, just ask people to name Jennifer Aniston movies next time. They’ll be there for you (clap, clap, clap, clap). Correction: A previous version called the “Hunger Games” movies a trilogy when there were four movies from three books. “Jimmy Kimmel Live!” airs weekdays at 11:35 p.m. ET on ABC.